A March 13, 1923 Ithaca Journal article noted that builder William D. McElwee "is completing the new concrete fireproof school on Cayuga Heights, which will accommodate nearly 100 pupils." The "new" Cayuga Heights district school at 110 E. Upland Road opened in September of that year. ​Set on park-like grounds, it was a beautiful, rambling Tudor-style building designed by the Ithaca architectural firm of Gibb & Waltz. Students from kindergarten through eighth grade attended the school. Martha L. Hitchcock (1869-1966), who had previously directed and taught at the private Campus School for more than two decades, was the school's first principal. Along with Principal Hitchcock and assistant Delia Stone, three other teachers rounded out the faculty. Each classroom had about 15 students. "With so few pupils for each teacher in spacious, airy rooms," explained an Ithaca Journal reporter, "much individual attention can be given to each child and correspondingly thorough instruction imparted." For both our work and play. "Cayuga Heights Review," June 1946. Principal Hitchcock led the school for twenty years, until her retirement in 1944. A brief biography of Principal Hitchcock written by her nephew Lawrence Bennett details Hitchcock's contributions to education in Ithaca. The Cayuga Heights school community put together a scrapbook tribute to Principal Hitchcock when she retired. 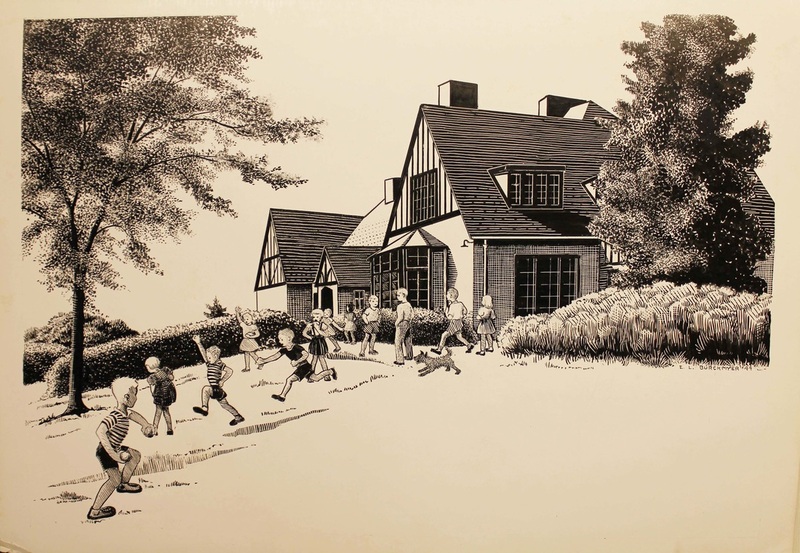 Elizabeth Burckmyer (1900-1985), scientific illustrator and Cornell professor of freehand drawing, produced a detailed etching of the building, which was later added on to in 1954 and 1957, for the scrapbook. In 1960, Principal Gerald E. Clark proposed that the school be named Hitchcock Hall for its beloved first principal. Doriseve Karch described a Beverly Cleary-esque seventh grade picnic to Robert H. Treman State Park. Click on the photo above to read about the class biking adventure that would be unheard of today.